A question I get very often is where to start with modifying an Aston Martin, especially when it comes to increasing power, and especially especially when it comes to making a 4.3L V8 Vantage faster. 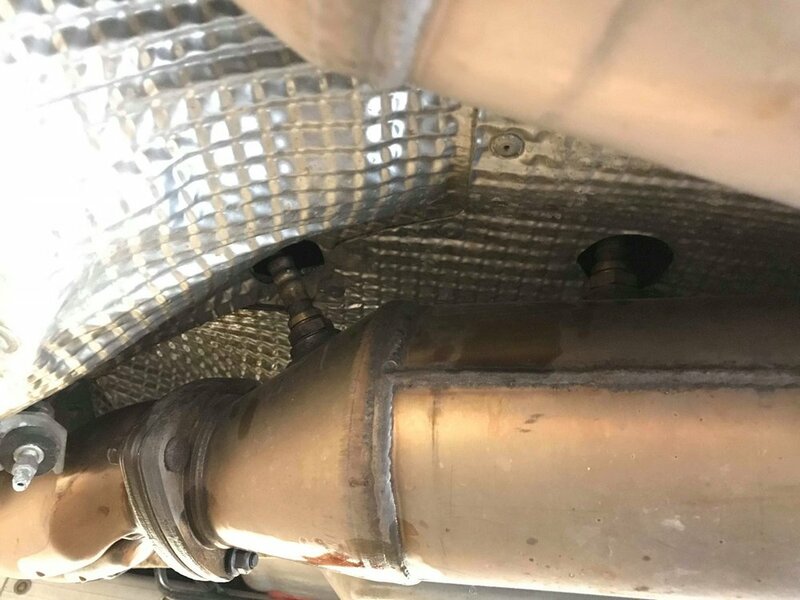 This DIY guide will show how to change the catalytic converters on a 2007 V8 Vantage to 200-cell high-flow units. The process is the same for all V8 Vantages, and is also the same for installing cat delete pipes in lieu of high-flow cats. You can also use this guide for changing your o2 sensors. *The parts you need can vary. Please check out our listings in the exhaust section of our online shop. I also cover the various components needed for each car in the Modification Guides section of Redpants. Make sure the car is completely cooled off!! You're working with exhaust components that get extremely hot and not allowing them to sufficiently cool off can result in serious injury. Rust-busting agents can take time to work. You may need to do Step 1 and Step 2 an hour or so in advance of the rest of this job to make it easier to get through rusty fasteners. You will need two 13mm box-end wrenches for this job because the clearances may be too tight to get a ratchet and socket in some places. Get the car on jack stands or use a lift. Use PB Blaster on all the fasteners at the front of the cats and on the clamps at the rear, and on the o2 sensors where they thread into the top of the cats. You may also want to spray the T30 bolts on the mid pipes just to the rear of the cats. Use the 22mm box-end wrench to loosen the o2 sensors. If you have trouble reaching them, you can save this for Step 7. You don't need to remove them entirely yet, just loosen them so you can spin them free once the catalysts are ready to be removed. Use the 13mm socket and ratchet (or the 13mm box-end wrench) to loosen the clamps at the rear of the cats. Spread the clamps apart so you can push the clamps off the cats and onto the mid-pipes. Use the 13mm socket, extension, and ratchet and the 13mm box-end wrench to loosen the top-most nut and bolt of one of the cats. To do this, use the socket, extension, and ratchet and approach it from the front of the car. If you have a hard time with the angle, use the optional wobble joint to make it easier to get the right angle. Use the 13mm box-end wrench to hold the rear of the fastener while loosening it with the socket/extension/ratchet. Repeat for the other catalytic converter. Use the two 13mm box-end wrenches to remove the other two fasteners on each catalyst. Some of the fasteners will be a nut on a stud. For these, the stud should stay in place while the nut spins free. Push the mid pipes to the rear of the car to free up enough space between the cats and the mid pipes. This space will allow you to pull the cats to the rear to clear the studs that connect the cats to the exhaust manifolds. If you're having a hard time getting enough space, use the T30 Torx bit and ratchet to remove the four Torx bolts on the mid pipes just to the rear of the cats. Pull one of the cats free and remove the o2 sensors from the cat. Set the cat aside and repeat for the other side. Make sure you remove both gaskets. The cats (or cat delete pipes) are specific to each side, so make sure you're putting the correct one in each place or they won't line up properly. You can see in the pic below that VelocityAP identifies each side with "LHS" (left-hand side) and "RHS" (right-hand side). Keep in mind, the side is based on the driver's perspective. In the US, we have left-hand drive (LHD) cars because the driver is on the left-hand side of the car while driving the car. The cars in the UK are right-hand drive (RHD). So, the LHS catalyst goes on the driver's side of the car in a US car. Put anti-seize on the mid-pipe clamp bolts, then attach one of the cats to the mid pipes and secure with the clamp. Repeat for the other cat, then push the mid pipes back toward the front of the car. Put a small amount of anti-seize on the threads of each of the o2 sensors. Be careful to avoid getting the anti-seize on anything but the threads. Spin the o2 sensors counter-clockwise to "pre-wind" the o2 sensors' wires, then install them in the cats. Pre-winding the wires makes sure they're not twisted once you tighten them into the cats. Use the 22mm box-end wrench to tighten down the o2 sensors. Note: If you have a hard time holding the cat in place while tightening the o2 sensors, you can do this after Step 11 instead, as there will be more space to work with high-flow cats or cat deletes compared to the OEM cats. Apply anti-seize to each of the new bolts. Hold a gasket in place between one of the the manifolds and cats, then put the new bolts through each of the flange holes. Spin a nut onto each just a few twists but without tightening them down. This will align the manifolds and cats, while also holding the gaskets in place. Once everything's set in place, start tightening them down. Put the car back on the ground. Fire it up and check for exhaust leaks. So long as everything's okay, you're done!